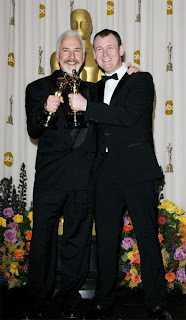 Canadian publisher Edge Science Fiction and Fantasy Publishing is ecstatic over artist David Elsey’s recent Oscar win. 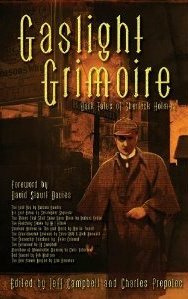 David designed the cover foe EDGE’s forthcoming release of GASLIGHT ARCANUM: UNCANNY TALES OF SHERLOCK HOLMES edited by J.R. Campbell and Charles Prepolec. Gaslight Arcanum is a follow-up to the Gaslight Grimoire (2008) and Gaslight Grotesque (2009) anthologies. Are you a Sherlock Holmes fan? 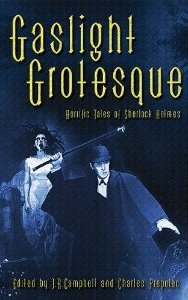 (Calgary, Alberta) Dave Elsey, this year's Oscar winner with Rick Baker for Best Makeup (for their work on "The Wolfman"), is the cover artist of the new Sherlock Holmes anthology GASLIGHT ARCANUM: UNCANNY TALES OF SHERLOCK HOLMES, edited by Charles Prepolec and J. R. Campbell scheduled for release by EDGE Science Fiction and Fantasy Publishing in Fall of 2011. "From creating fantastical creatures in the television series Farscape to plant-wrangling skills in The Little Shop of Horrors, Creature Fx Designer Dave Elsey has demonstrated an extraordinary ability to create memorable characters using make up." "Elsey is a phenomenal artist, bringing magic to any medium he works in", says Brian Hades, owner of Hades Publications, of which EDGE Science Fiction and Fantasy Publishing is an imprint. "We are very pleased to join with the hundreds of other people in congratulating Elsey and Baker on their Oscar win. 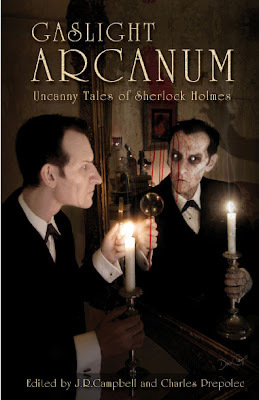 We are equally excited to announce that Dave Elsey's art will grace the cover of "Gaslight Arcanum: Uncanny Tales of Sherlock Holmes" edited by J. R. Campbell and Charles Prepolec." "We believe that the haunting nature of Elsey's work for the "Gaslight Arcanum: Uncanny Tales of Sherlock Holmes" cover is a great fit for the powerful tales contained within." says Hades. "MY NAME IS SHERLOCK HOLMES. IT IS MY BUSINESS TO KNOW WHAT OTHERS DO NOT." In the dark lurk horrible secrets. Long buried and hidden from prying eyes are the twilight tales of the living and the dead - and those that lay in between. The stink of a Paris morgue, the curve of a devil’s footprint, forbidden pages torn from an infernal tome, madness in a dead woman’s stare, a lost voice from beneath the waves and the cold indifference of an insect’s feeding - all hold cryptic clues for Sherlock Holmes, the original dark-knight detective, as he drags the hidden horrors kicking and screaming into the light! Art will include cover by: Dave Elsey, interior art by Luke Eidenschink and frontispiece by Hellboy's Mike Mignola. To Doug - been missing you - Drop me a line sometime.